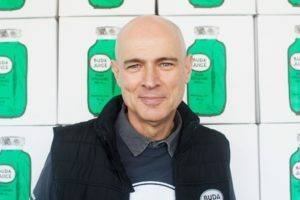 British-born Horatio Lonsdale-Hands, 60, is the co-founder, Chairman & CEO of Buda Juice®, the only company in the United States that offers USDA certified organic, fresh, unprocessed cold-pressed juices in glass bottles, available to consumers coast to coast and the only company that provides an unbroken cold chain — from farm to glass bottle to consumer. 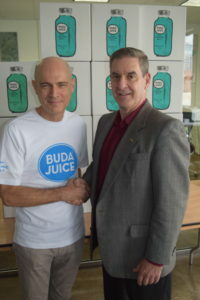 In 2001, prior to Buda Juice, Horatio co-founded and was President of Advance Global Communications (AGC). Before AGC, Horatio co-founded Mexican food restaurant ZuZu, Inc. (Handmade Mexican Food), where he served as Chairman and CEO between 1989 and 1998. In 1982, he co-founded and was President of Nipper’s Champagne and Caviar clubs in California. With two locations (Montecito and Rodeo Drive, Beverly Hills), Nipper’s was hailed as the unofficial and often quoted “ambassador of champagne” in the United States and hosted the 1984 Academy Award Nominations Party for Time and People magazines, Victory Party for The Jacksons and Andy Warhol parties every quarter for the art crowd.